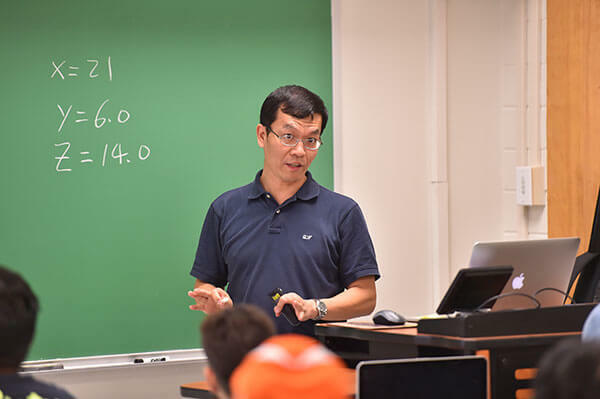 The Master of Science in Computer Engineering program focuses on the fundamental design principles of digital computers. This degree prepares students for highly technical positions in fields such as computer networking, communications systems, integrated systems, fiber optics, microprocessors, robotics, software design, embedded systems, computer architectures, digital systems design and electronics. St. Mary’s also offers a Bachelor of Science in Computer Engineering degree. Computer engineers design and implement computer systems – both hardware and software. Computer engineering is a combination of electrical engineering (hardware) and computer science (software and systems), and computer engineers work on the entire computer system, from networks to embedded systems to software. Student can select from either a thesis or project options, with specific requirements for each. Topics of concentration include computer architecture, parallel processing, microprocessors, computer networking, and software engineering. This program offers a balanced curriculum in hardware and software, while allowing students to tailor their degree to focus in hardware, software or both. The department also offers a unique five-year combined Bachelor of Science and Master of Science in Computer Engineering. Undergraduate students begin graduate course work during their senior years and complete a master’s degree in one additional year. Have a bachelor’s degree in Computer Engineering, Electrical Engineering or a closely related discipline. Applicants who earned a bachelor’s degree in a closely related discipline, such as computer science, physics or mathematics may be admitted with the provision that they take the prerequisite courses listed below. The Graduate Program Director will evaluate these cases on an individual basis. International student must submit the TOEFL scores and show a minimum of 80 in the Internet-based test or 213 in the computer-based test or 550 in the paper-based test. As an alternative to the TOEFL, International Student can take the IELTS test and show a minimum score of 6.5 or better. A score of 6.0 is acceptable with the provision that the student takes EN6301 during the first semester at St. Mary’s University. No student will be admitted with score lower than 6.0 in the IELTS test.